Quest were delighted to attend the 2017 Irish HR Champion Awards on Friday 24th of March. 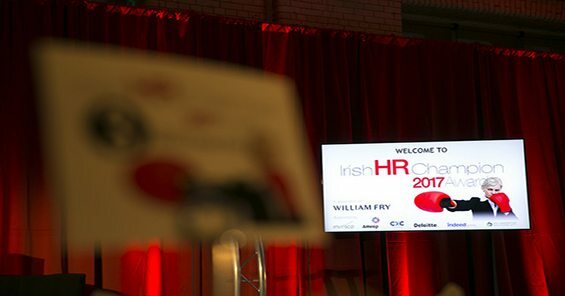 These awards took place in the historic Guinness Storehouse and were created to honour the hard work and devotion of HR teams across the country who strive to impact business and organisational performance. The HR Champion Awards recognise the success, innovation and dedication of HR professionals across the board. Winners of the night included:Voxpro (CSR Strategy), Vodafone (Champion Diversity Strategy), Vodafone and RCSI (Wellness Strategy), Fexco (Talent Acquisition Programme), Musgrave (Change Management), Topaz (Learning & Development), Bank of Ireland (Champion Leadership Programme), Savills (Employer Branding). Special thanks to Donna ‘Connor, owner of Black Square events whose team organised the fantastic evening. The awards ceremony also included a fantastic networking drinks reception in the World of Advertising followed by an inspiring speech from Dragons’ Den Norah Casey who reminded us to ‘’Set a Satnav for your future’’. Gavan Hennigan, Adventurer and Extreme Environment athlete also shared a story of mental strength and overcoming adversity. This celebratory night was thoroughly enjoyed by all parties.